Ñ (lower case ñ, Spanish: eñe, Phonetic Alphabet: /ˈeɲe/ "énye", pronunciation (help·info)) is a letter of the modern Latin alphabet, formed by placing a tilde (also referred to as virgulilla in Spanish) on top of an upper- or lowercase N. It became part of the Spanish alphabet in the eighteenth century when it was first formally defined, but it is also used in other languages such as Galician, Asturian, the Aragonese Grafía de Uesca, Basque, Chavacano, Filipino, Chamorro, Guarani, Quechua, Mapudungun, Mandinka, and Tetum alphabets, as well as in Latin transliteration of Tocharian and Sanskrit, where it represents [ɲ]. It represents [ŋ] in Crimean Tatar and Classical Malay. In Breton and in Rohingya, it denotes nasalization of the preceding vowel. Unlike many other letters that use diacritic marks (such as Ü in Spanish and German and Ç in French, Catalan and Portuguese), Ñ in Spanish, Galician, Basque, Asturian, Leonese, Guarani and Filipino is considered a letter in its own right, has its own name (in Spanish: eñe), and its own place in the alphabet (after N). Its alphabetical independence is similar to the English W, which historically came from a doubled V.
Historically, ñ arose as a ligature of nn; the tilde was shorthand for the second n, written over the first; compare umlaut, of analogous origin. This is a letter in the Spanish alphabet that is used for many words, for example, the Spanish word año (anno in Old Spanish) meaning "year" and derived from Latin ANNVS. Other languages used the macron over an n or m to indicate simple doubling. Already in medieval Latin palaeography, the sign that in Spanish came to be called virgulilla (meaning "little comma") was used over a vowel to indicate a following nasal consonant (n or m) that had been omitted, as in tãtus for tantus or quã for quam. This usage was passed on to other languages using the Latin alphabet although it was subsequently dropped by most. Spanish retained it, however, in some specific cases, particularly to indicate the palatal nasal, the sound that is now spelt as ñ. The word tilde comes from Spanish, derived by metathesis of the word título as tidlo, this originally from Latin TITULUS "title" or "heading"; compare cabildo with Latin CAPITULUM. From spellings of anno abbreviated as ãno, as explained above, the tilde was thenceforth transferred to the n and kept as a useful expedient to indicate the new palatal nasal sound that Spanish had developed in that position: año. The sign was also adopted for the same palatal nasal in all other cases, even when it did not derive from an original nn, as in leña (from Latin ligna) or señor (from Latin senior). The palatal nasal sound is roughly reminiscent of the English consonant cluster /nj/ canyon /ˈkænjən/. While this common description is enough to give a rough idea of the sound, it is not precise. It is analogous to giving the pronunciation of the English word shot as "syot". Other Romance languages have different spellings for this sound: Italian and French use gn, a consonant cluster that had evolved from Latin, whereas Occitan and Portuguese chose nh and Catalan (ny) even though these digraphs had no etymological precedent. When Morse code was extended to cover languages other than English, the sequence ( — — · — — ) was allotted for this character. Although ñ is used by other languages whose spellings were influenced by Spanish, it has recently been chosen to represent the identity of the Spanish language, especially as a result of the battle against its obliteration from computer keyboards by an English-led industry. In Spanish and some other languages (such as Filipino languages, Aymara, Quechua, Mapudungún, Guarani, Basque, Chamorro, Leonese, Yavapai and Tetum), whose orthographies have some basis in that of Spanish, it represents a palatal nasal. In Galician, it represents such a sound, but it was probably not adopted from Spanish, as evidenced by its presence in the first Galician-Portuguese written in Galicia conserved text (Foro do bo burgo de Castro Caldelas [gl], written in 1228). Other Romance languages also have the sound, written nh in Occitan (espahnòl/espanhòu) and Portuguese (espanhol), gn in Italian (spagnolo) and French (espagnol), and ny in Catalan and Aragonese (espanyol). The accented letter ń used in Polish and the character ň used in Czech and Slovak are also equivalent to the Spanish letter ñ. The same sound is written ny in Indonesian, Zhuang, and Hungarian, and nh in Vietnamese and Portuguese. In Tagalog, Visayan, and other Philippine Languages, it is also written as ny for most terms. The conventional exceptions (with considerable variations) are proper names, which usually retain ñ and their original Spanish or Hispanicised spelling (Santo Niño, Parañaque, Mañalac, Malacañan). It is collated as the 15th letter of the Filipino alphabet. In old Filipino orthography, the letter was also used, along with g, to represent the velar nasal sound [ŋ] (except at the end of a word, when ng would be used) if appropriate instead of a tilde, which originally spanned a sequence of n and g (as in n͠g), such as pan͠galan ("name"). That is because the old orthography was based on Spanish, and without the tilde, pangalan would have been pronounced with the sequence [ŋɡ] (therefore pang-GAlan). The form ñg became a more common way to represent n͠g until the early 20th century, mainly because it was more readily available in typesets than the tilde spanning both letters. It is also used to represent the velar nasal in Crimean Tatar. In Latin-script writing of the distantly-related Tatar language, ñ is sometimes used as a substitute for n with descender, which is not available on many computer systems. In the Breton language, it nasalises the preceding vowel, as in Jañ /ʒã/, which corresponds to the French name Jean and has the same pronunciation. It is used in a number of English terms of Spanish origin, such as jalapeño, piña colada, piñata, and El Niño. The Spanish word cañón, however, became naturalized as canyon. Until the middle of the 20th century, adapting it as nn was more common in English, as in the phrase "Battle of Corunna". Now, it is almost always left unmodified. In the orthography for languages of Senegal, ñ represents the palatal nasal. Senegal is unique among countries of West Africa in using this letter. The Lule Sami language uses the letter ń, which is often written ñ on computers, since ñ but not ń was available on keyboards and in the Latin-1 character set. The letter Ñ has come to represent the identity of the Spanish language. Latino publisher Bill Teck labeled Hispanic culture and its influence on the United States "Generation Ñ" and later started a magazine with that name. Organizations such as the Instituto Cervantes and the National Association of Hispanic Journalists have adopted the letter as their mark for Hispanic heritage. It was used in the Spanish Republican Air Force for aircraft identification. The circumstances surrounding the crash of serial 'Ñ' Potez 540 plane that was shot down over the Sierra de Gúdar range of the Sistema Ibérico near Valdelinares inspired French writer André Malraux to write the novel L'Espoir (1937), translated into English as Man's Hope and made into the movie named Espoir: Sierra de Teruel. In 1991, a European Community report recommended the repeal of a regulation preventing the sale in Spain of computer products not supporting "all the characteristics of the Spanish writing system," claiming that it was a protectionist measure against the principles of the free market. This would have allowed the distribution of keyboards without an "Ñ" key. The Real Academia Española stated that the matter was a serious attack against the language. Nobel Prize winner in literature Gabriel García Márquez expressed his disdain over its elimination by saying: "The 'Ñ' is not an archaeological piece of junk, but just the opposite: a cultural leap of a Romance language that left the others behind in expressing with only one letter a sound that other languages continue to express with two." Among other forms of controversy are those pertaining to the anglicization of Spanish surnames. The replacement of ñ with another letter alters the pronunciation and meaning of a word or name, in the same manner that replacing any letter in a given word with another one would. For example, Peña is a common Spanish surname and a common noun that means "rocky hill"; it is often anglicized as Pena, changing the name to the Spanish word for "pity", often used in terms of sorrow. When Federico Peña was first running for mayor of Denver in 1983, the Denver Post printed his name without the tilde as "Pena." After he won the election, they began printing his name with the tilde. As Peña's administration had many critics, their objections were sometimes whimsically expressed as "ÑO." Since 2011, CNN's Spanish-language news channel incorporates a new logo wherein a tilde is placed over two Ns. Another news channel, TLN en Español, has "tlñ", with an ñ taking the place of the expected n, as its logo. The city council of A Coruña changed the placement of the tilde from over the ⟨n⟩ to over the initial ⟨c⟩ to create a logo, in a way similar to what was done by the city of Göteborg that changed the dieresis of the ⟨ö⟩ to a colon (⟨Go:teborg⟩). The ⟨ñ⟩ is however not used in the URL. 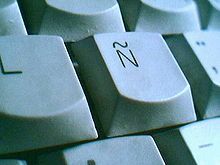 Ñ is to the right of L on a Spanish keyboard layout. In Unicode Ñ has the code U+00D1 (decimal 209) while ñ has the code U+00F1 (decimal 241). Additionally, they can be generated by typing N or n followed by a combining tilde modifier, &#x303, U+0303, decimal 771. In HTML character entity reference, the codes for Ñ and ñ are &Ntilde; and &ntilde; or &#209; and &#241;. Ñ and ñ have their own key in the Spanish and Latin American keyboard layouts (see the corresponding sections at keyboard layout and Tilde#Role of mechanical typewriters). The following instructions apply only to English-language keyboards. On Android devices, holding n or N down on the keyboard makes entry of ñ and Ñ possible. On Apple Macintosh operating systems (including Mac OS X), it can be typed by pressing and holding the Option key and then typing N, followed by typing either N or n.
On the iPhone and iPad, which use the Apple iOS operating system, the ñ is accessed by holding down the "n" key, which opens a menu (on an English-language keyboard). Apple's Mac OS X 10.7 Lion operating system also made the "ñ" available in the same way. To make a lowercase ñ in the Microsoft Windows operating system, hold down the Alt key and type the number 164 or 0241 on the numeric keypad (with Num Lock turned on). To make an uppercase Ñ, press Alt-165 or Alt-0209. Character Map in Windows identifies the letter as "Latin Small/Capital Letter N With Tilde". A soft (not physical) Spanish-language keyboard is easily installed in Windows. In Microsoft Word, Ñ can be typed by pressing Control-Shift-Tilde (~) and then an N.
On Linux it can be created by pressing Ctrl+Shift+U and then typing '00D1' or '00F1', followed by space or Ctrl to end the character code input. This produces Ñ or ñ. Another option (for any operating system) is to configure the system to use the US-International keyboard layout, with which ñ can be produced either by holding Alt Gr and then pressing N, or by typing the tilde (~) followed by n.
Yet another option is to use a compose key (hardware-based or software-emulated). Pressing the compose key, then ~, and then n results in ñ. A capital N can be substituted to produce Ñ, and in most cases the order of ~ and n can be reversed. The letter Ñ may be used in internationalized domain names, but it will have to be converted from Unicode to ASCII during the registration process (i.e. from www.piñata.com to www.xn--piata-pta.com). In URLs (except for the domain name), Ñ may be replaced by %C3%91, and ñ by %C3%B1. This is not needed for newer browsers. The hex digits represent the UTF-8 encoding of the glyphs Ñ and ñ. This feature allows almost any Unicode character to be encoded, and it is considered important to support languages other than English. ^ a b "El Triunfo De La Ñ – Afirmación De Hispanoamerica | Blog De Luis Durán Rojo". Blog.pucp.edu.pe. Retrieved 2015-05-31. ^ "O FORO DO BO BURGO DO CASTRO CALDELAS, DADO POR AFONSO IX EN 1228" (PDF). Consellodacultura.org. Retrieved 2015-05-31. ^ "Foro Do Bo Burgo Do Castro Caldelas, Dado Por Afonso IX En 1228" (PDF). Agal-gz.org. Retrieved 2015-05-31. ^ "Generation-Ñ". Generation-n.com. Retrieved 12 October 2014. ^ Note that this depends on locale. E.g. will generate ń in some eastern European locales, and there is no alternative keystroke for ñ in these locales. The same applies to uppercase Ñ.
Wikimedia Commons has media related to Ñ.